Award Winners Continued, Continued- Interestingly enough, Denard Robinson was not a first or second team QB selection, but was given the nod as the Offensive Player of the Year for the Conference. So… best offensive player, but not a QB. Someone please send this note to Rodriguez. Also- The answer, obviously, ugly(er) uniforms. 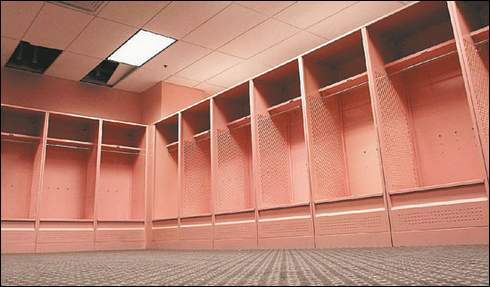 Stay Classy- Following their loss to FSU, Gator players did a bit of redecorating in the visitor’s locker room. Wonder if we can get them to play at Iowa… Of course there are two perspectives to this story. Everyone’s A Critic- One of the reasons I never got to play DJ in college was my questionable taste in music (as, I’m sure, you’ve experienced). Sounds like the folks at Alabama have a similar experience, after firing the audio technician who played Steve Miller and Dusty Springfield prior to the Iron Bowl. Actually, that’s pretty freaking funny stuff; although he should have remembered the solitary truth about music for SEC games. Uh, Yeah… I’ve Got A Thing That Day- Interesting couple of days for Southern Idaho State fans. First, their kicker uncharacteristically cost them a shot at an undefeated season. Then, the other shoe dropped- their “Jeffersons Moment” was derailed as TCU bailed from the Mountain West. So, the Broncos’ hopes of credibility playing Utah, TCU, and BYU has all died to the PAC 12, Big East, and “being independent”. When folks would rather not be in a conference than play on the Smurf Turf, they’re really working hard to avoid the Boise Bullies. Guess who's not getting a Christmas card. 1) Started a very quiet coaching search in the middle of the season – without talking to anyone so as to keep it in house. 2) Been ready to fire RichRod immediately after the OSU game, no matter the cost. 3) Hired their new coach on the spot so as to give them the extra bowl practices RichRod finally earned. This would give them a leg up on getting their team in shape for next season. Look, this is Michigan we’re talking about here. Do you honestly believe that there is a single coach in the country not already at an elite program that would turn them down? All they have to do is snap their fingers and coaches would come running. Do a solid job of picking out the guy who’s gonna make Michigan go again – and quickly. Preferably a guy like Gary Patterson at TCU – a traditional smash mouth hard-nosed football coach – and give him a job offer as soon as reasonably possible. Don’t waste valuable practices on a guy that you know for certain you don’t want anymore.